At what point do you realise that the country thinks you’re worthless? Asking for a friend who came over to the UK on the Windrush on June 22 1948. The British government of the day invited her family to work in the country. They accepted the invite, and came across the Atlantic Ocean in search of better lives. In 1971, Commonwealth migrants were given indefinite leave to remain in the UK. My friend and many like her are now being offered the chance to return from whence they came decades ago and have never returned to since – or else. The British government has been rounding up these workers from the Commonwealth. Michael Braithwaite is 66. He’s lived in the UK since he was nine. If time spent in the country is a measure of citizenship, Mr Braithwaite is more British than Prince Harry and Amber Rudd, the Home Secretary. Last year. Mr Braithwaite, who worked as a special needs teaching assistant, lost his job. He was branded an illegal immigrant. ‘Albert Thompson’ (not his real name; he wants no publicity) has lived in Britain for 44 years. He was offered the chance to produce a British passport or pay £54,000 for his cancer treatment. He didn’t have the money nor the passport. So he went without. He was evicted from his home and spent three weeks homeless. Paulette Wilson left Jamaica when she was 10. She’s lived in the UK for more than 50 years. She was employed at the House of Commons, where she served food to MPs. Aged 61, the State threw her into Yarl’s Wood detention centre for a week and told she’d be deported. At the last moment, someone finally listened to her and she won a reprieve. These people’s crime was to have never applied for a British passport. In its haste to clamp down on immigration, the Government decreed that all migrants in search of work, housing or benefit must provide documents. But the Windrush children who arrived here on their parents’ passport and never applied for their own. This presented them with a hideous problem. From being British citizens they were are the stroke of a pen turned into criminals. Guilt is assumed. They have to prove their innocence. They must do this by showing official documents for each year of their stay in the UK. Amber Rudd has now apologised for this horror. After much asking, Theresa May has finally has only just agreed to meet with Commonwealth leaders to discuss the matter. Until last Friday, the Government’s advice was for anyone worried about deportation to speak with a lawyer, placing the onus on the innocent to find the time and money to make right the Home Office’s egregious error and demeaning oversight. Hiring lawyers is often stressful and expensive – the cost becomes prohibitive when you can’t earn money. But now Amber Rudd says she’s sorry. She says her department “sometimes loses sight of the individual”. Nonsense. They only do that when the individual doesn’t matter. They didn’t lose sight. They never saw them to begin with. 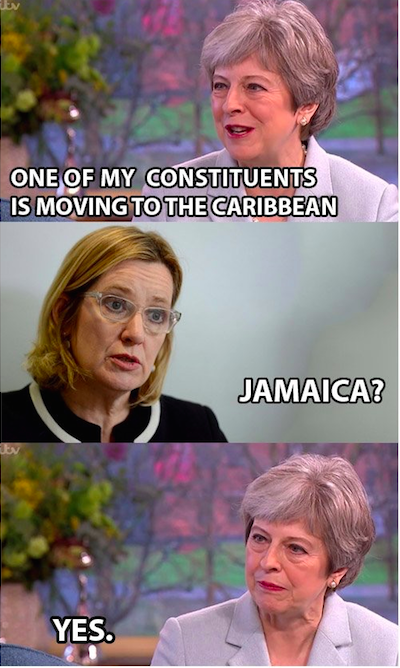 Rudd’s set up a task force of 20 Home Office wonks to help her notice people who have lived and worked in the UK for decades. That’s how valued my friend is – Rudd needs 20 people to notice her contribution to the country. She only became visible when the State wanted to make an example of her and send her ‘home’.